Get ready for some serious #summerbody inspiration. 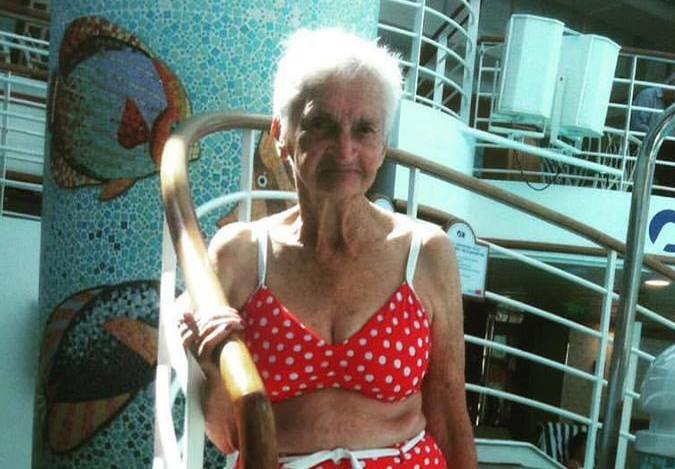 Ninety-year-old Irene Carney rocked this red polka-dotted bikini on a cruise earlier this month, after the staff at her elderly care home convinced her to. The Australian woman found the stunning two-piece at a Lady Watego clothing shop near her daughter’s home last month. She originally wanted a kaftan, but it’s clear she was meant to wear the bikini — just look at her sassy pose. Now she’s becoming a social media star after the owner of Lady Watego posted the photo on her store’s Facebook page. “My message is always to get out, enjoy yourself, and you are never too old for swimmers!” Wendy Beckers told BuzzFeed of why she posted the photo. And why not? Any body is a bikini body — just put a bikini on your body. We’re finally living in a world that — despite its flaws — is putting plus-size and mature models on the covers and pages of the Sports Illustrated swimsuit issue. Fifty-six-year-old Nicola Martin made history earlier this year when she showed off some badass curves in SI — and she’s only been a model for three years. “Whatever size or shape you are, you too can go out and get yourself a bikini and look good and feel good. You don’t have to stay home and think, ‘My body’s not ready this summer.’ It’s not about that. It’s about showing off what you’ve got right now,” Griffin said.